Sirens’ Redux is a fully-improvised show that brings new insights to everyday relationships. Using quick concentrated scenes that flow into longer, more complex scenes, audiences will enjoy watching Sirens’ years of familiarity and agility as they weave funny and interesting tales. 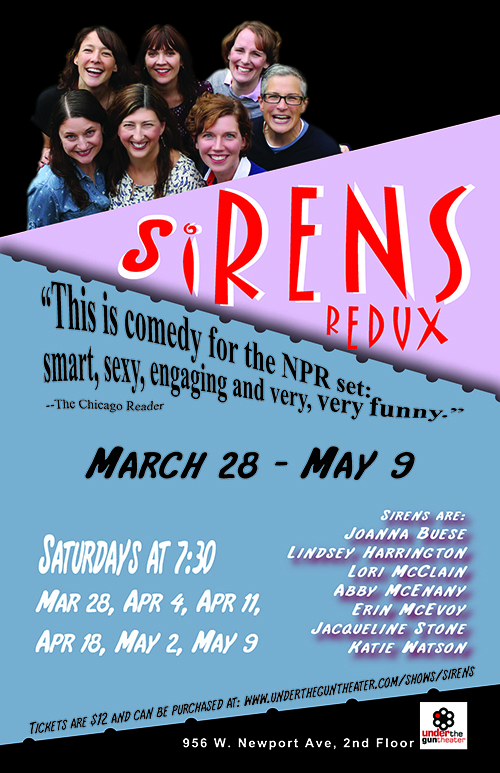 Through emotionally grounded characters, some personal anecdotes from the cast, and Sirens’ usual quick wit, Redux explores the richness and the absurdity of the human condition with joyful abandon. In July of 2014, Sirens closed a monthly run at The Second City’s deMaat Studio Theatre that lasted over three years. They have been wowing audiences with their thoughtful, lively, complex and innovative improv forms such as Paso Doble (Highly Recommended- The Reader), Clutch, Straight to Video, KINK, Chicken Scratch (Highly Recommended- The Reader) and Token Male. They have performed at the Chicago Improv Festival, Del Close Marathon in New York, Chicago Funny Women’s Festival, and more. The Sirens’ individual and collective improv and theater experience is vast. Its members have performed with such theaters as The Second City, iO, Annoyance, ComedySportz, Tuta Theatre, Improvised Sondheim Project, WNEP, and Upstairs Gallery among others.